Genre: Biography, Child Abuse, Tragic Life Stories, Social & Health Issues, Family & lifestyle, Biographies & memoir, Autobiography, Family Relationships. I bought this book along with a child called it and a man named dave. The school nurse of Thomas edison elementary school and the daly city police officer. In memory of Pamela Eby, who gave her life to saving the children of Florida. To my parents, who always knew Harold and Alice Turnbough. And finally, to my son, Stephen, whose unconditional love for who l am and what l do keeps me going. I love you with all my heart and soul. Bless you all, for it takes a community to save a child. This book has 352 pages and 19 chapters in it. I would tell people that you should step outside your comfort zone with books because it is good to add more authors and genres to your reading portfolio. Even if you do not read books like this. I normally read books of this genre but l also stepped outside my comfort zone with authors and genres l am so glad l did because l have read so many great book and come across some great authors. I highly recommend this book but l would tell people to buy a child called it and a man named Dave so you can read the full story not just half of it. Synopsis: As a child, Dave Pelzer never had a real home, rescued from an alcoholic, abusive mother: his only possessions were the old torn clothes he carried in a paper bag: the only world he knew was one of isolation and fear. 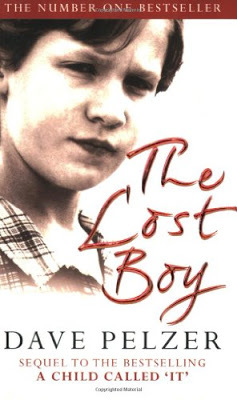 In the lost boy Dave pelzer relives his life as a foster child, in and out of five different homes. There were those who felt that all foster kids were trouble – unworthy of love – and resented his presence, forcing him to suffer yet more shame. But though it all Dave never stopped hoping and searching for the love of a real family. This book is the follow on to a child called it and Dave is still looking for the loving home he dreams of but it still has not come along yet. Dave finally finds a house filled with love and a nice couple who foster children and Dave finds his father who tells Dave that his mother been on at him to sign some papers and Dave did not know what the papers he was on about. Lilian told Dave his mother is trying to get his father to sign papers signed to put him in an institution and Lilian asked Dave if David's father had signed the papers and David said no. His mother said David had a mental illness and she wanted him locked up. Review: I was happy to carrying on reading about Dave as l have read a child called it. This is the follow on to it. I found this book really easy to get in to and hard to put down once l had started reading it. I was happy to read Dave had found a better life for himself but his mother is still trying to destroy his life even though he does not live with her anymore. I think she should just leave him alone to get on with his life. I am glad his father did not sign the papers to have him locked up in an institution because he does not sound like he has a mental illness l think she is trying to say he does so she can say everything he is saying is lies. She can not wait to destroy his life for him because she does not have control of him anymore which l am glad she does not. Dave deserves better than his mother l am glad his father got away from her too. David has other plans for his life and he joins the air force and does something good and he has one son Stephen. David's mother sounds like a horrible women who does not deserve children. I am glad david did something with his life and did not let his mother win. David sounds like a great guy and father. as The Outstanding Young Person of the World! In 1996, he carried the coveted Centennial flame for the Olympic Games. Dave was paid tribute as the recipient of the 2005 National Jefferson Award. Other alumni of this award include Colin Powell, Sandra Day O’Connor and Bob Hope.Dave is the author of seven inspirational books. Dave’s latest book, Moving Forward deals with helping people take the lead in their lives. Dave’s first book, A Child Called “It”, was on the New York Times Best Sellers List for over 6 years and Dave’s books have been on the same Best Sellers List approaching 13 years combined. As an author Dave is the first to have four # 1 International Best Sellers and to have four books simultaneously on the New York Times Best Sellers List.Dave is a living testament of a self-made man, who as an optimist strongly exudes resilience, service to mankind, personal responsibility and faith in humanity. Dave’s unique and intriguing outlook on life, coupled with his “Robin Williams” like wit and sense of humor entertain and encourage all of us to truly commit to overcome any challenge, while living life to its fullest.For over two decades, Dave has dedicated his life helping others . . . to help themselves. While many make excuses and seem pessimistic, Dave carries the banner in a nation where opportunities are endless in what he calls “The Greatness of America”. And through his work, you will too. About The Book: I really like the book cover and that it is black and white the cover is not too boring.